I hooked up with World Cat Marketing VP Dave Tuchler at the 2016 Ft. Lauderdale Boat Show and spent some quality time on this next-gen fishing catamaran, getting totally immersed in her bluewater capabilities. She is definitely more than just a one-trick pony. Sure, she will give you the smooth and stabile ride of a catamaran when things get bouncy offshore. But the 280CC-X will also do it in style, with striking good looks and a new level of comfort features that will make this newbie equally as adept at entertaining a half dozen friends on a sunset cruise, as well as being the ultimate beach water taxi for family adventures. When called upon to head offshore, the 280CC-X can fish with the best of them. Standard features include a total of four flush-mounted rodholders in the gunwales, plus an additional quartet set in the transom. 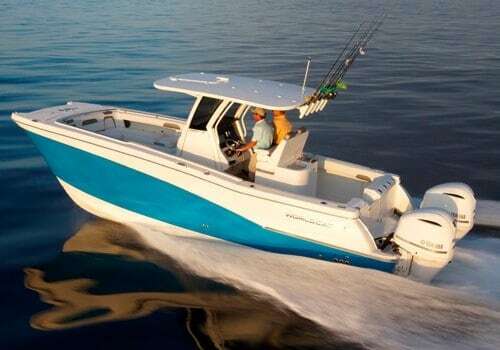 Fishbox capacity on this cat is totally out of bounds, with twin 355-quart in-floor insulated boxes port and starboard, accessed via flush hatches. Each fishbox has its own dedicated diaphragm pump to evacuate the icy gurry at the end of the trip. But that’s not all; these boxes also accommodate rod storage (up to four per side), in addition to keeping a 5-gallon bucket ready for deployment. Need more fishbox capacity? No problem, a pair of 180-quart insulated boxes with overboard drains set under the raised bow seating will take care of business and also double as convenient stowage areas for your safety gear, tackle boxes or whatever. The fiberglass leaning post includes a tackle center with a 30-gallon insulated livewell with 1,100 gph magnetic drive pump and an overboard drain. Freshwater and raw water washdown complete the fishing accoutrements and make it easy to hose off the cockpit sole when there’s blood on the decks. A fiberglass hardtop with surfboard edge and powder-coated frame with built-in glass windshield is standard, but you’ll have to spring for the added-cost five-rod rocket launcher from the options list. The 280CC-X makes full use of her spacious layout and twin sponson design to offer as much room as possible onboard to make any family fun time a completely enjoyable experience. The head area under the console includes a Corian counter top, with mirror and toiletries storage. The forward-facing wide console door makes for easy entrance and exit. The bow area features seating for seven, supported by a dedicated 36-quart bow cooler compartment, so you don’t have to stray too far when reaching for a cold beverage. You can enjoy your favorite tunes courtesy of the standard Fusion marine stereo, with four JL Audio speakers and Bluetooth capability. Heading aft, the latched walk-through transom door provides easy access to the swim platform. A double-wide aft fold-down transom seat provides even more entertainment functionality, but tucks easily out of the way when it’s time to bend the rods. Safety is not an afterthought on the World Cat 280CC-X, with twin 1500-gph aft bilge pumps and a pair of 500-gph pumps forward. There’s an integrated 3-bank battery charging system that should keep your electronics cooking from sunup to sundown. The glass dash console is equipped with a standard Garmin GPSMAP 7612xsv 12-inch multi-function display with an Airmar thru-hull transducer. The NMEA-2000 compatible Mastervolt CZone digital switching system is truly amazing and represents state of the art capability that historically was only available on large mega-yachts. There is only one way to power up this cat and that’s with Yamaha F200s. These in-line, four-cylinder four-strokes are relatively lightweight and will enable this feline to hit a top speed approaching 48 mph, so she can scurry when there’s a hot bite on the opposite end of the bay. Dialing it down to a more sedate cruising speed of 30 mph will net approximately 2 mpg, which will provide 375-mile+ range if you keep a judicious hand on the throttle, so the distant canyons are calling.